Elevo is a CAA Part 102 Certificated drone operator, based in Wellington and servicing all of New Zealand. Our experienced team provide data-driven drone services to clients involved in many industries including infrastructure, resources, agriculture, environmental, and government. Elevo has been a commercially licensed drone operator in Australia since 2016, and we are now excited to be able to offer our services to the New Zealand market. We provide asset owners with a quick, safe and cost-effective way to visually assess the condition of their elevated assets. We have extensive experience gained from inspecting over 2000 structures including schools, train stations, office buildings, bridges, flare stacks, pipelines, warehouses and factories. Inspection of a live flare stack in Western Australia. We output visual and/or thermal imagery, geo-located and organised ready for your engineers to assess and action. As-built inspection on a metropolitan train station in Perth. If required we can also model your asset in 3D to measure damage and optimise your maintenance tendering and supervision. Damage measurements on an asbestos roof at Fremantle Port. Accurate and timely spatial data helps you plan, run and reconcile your operations and projects. Our drones can be gathering visual, thermal, survey and vegetation data from above with no impact on your activities below. We can measure and report stockpile or landfill volumes, generally with a 24 hour turnaround to enable quicker reporting of your inventories. Quarry stockpile map accompanying a volume report. We can map development and construction sites, using visual, vegetation and thermal sensors. 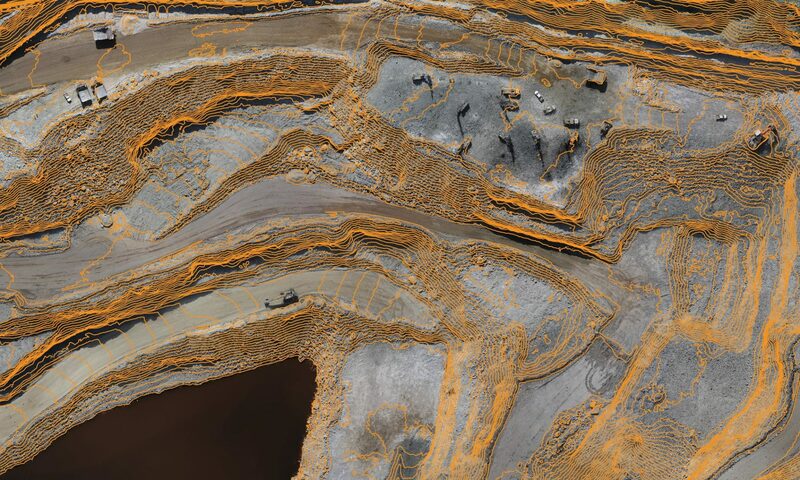 This data can be integrated with ground surveys to provide highly detailed DSMs and ortho-rectified imagery. 2cm resolution mapping for urban re-development planning in Bunbury, WA. Drones are particularly useful for gathering data in areas that are hazardous or are environmentally sensitive. High resolution 3D model of a volcanic cone showing visual and topographical data. Thermal is also possible. Agriculture research trials can be analysed during the growing season to provide unbiased plant health data for analysis and marketing. NDVI analysis and relative scoring of a fertiliser research trial in wheat. Vineyards, horticulture and forestry plots can be mapped for plant health and plant counts, to optimise inputs and plan selective harvesting. NDVI mapping on a Swan Valley vineyard showing vine health variance (and a water leak). Our thermal imaging can be used for mapping, environmental monitoring, search and rescue, and electrical and solar panel inspections. Our drones can be used for water sampling and gas monitoring for scientific research and environmental monitoring. Heavy-lift drone equipped with portable dust monitor. Our larger drones are slung-load capable, and can be used for installing equipment and stringing power/communications lines in otherwise inaccessible locations. Elevo payload system being used to install fibre-optic cable on a WA mine-site. We can also bring in equipment as required, such as power tethers for continuous surveillance. We’re always happy to develop new applications, so if you have an idea you want to explore, please get in touch for a confidential discussion. We’re results oriented, but the safety of your people, assets and reputation will always come first in our operations. Elevo holds a Part 102 Certificate issued by the Civil Aviation Authority of New Zealand (CAA). All of our operators are professionally trained and hold Remote Pilot Certificates issued by CAA authorised assessors. We have CAA approved risk assessment procedures in place for every job, and we are happy to provide input to and work within client/site specific systems when required. Our team will arrive at your site in high-vis PPE, and in a modern 4WD vehicle with a beacon and UHF radio. Other requirements can be accommodated if necessary. We are fully insured with aviation-specific third party liability to $20M, and professional indemnity coverage. .. …. … . …. …… .. . . .. . .
.. . . . . . .. . . . . . . . . . .